Brunch has become more than pancakes and Bloody Mary's—it’s an opportunity to enhance the morning conversation, if only to recount the previous night’s events. In Stockton, brunch is a celebrated ritual for many lifestyle types, from students and river travelers to weekend warriors from both near and far. New Orleans-inspired flavors and textures are pouring out of this Miracle Mile diner that specializes in lightweight, delicious crepes. Whether you’re in the mood for something sweet or savory, Midtown Creperie has a crepe to fix what ails you. With its brick interior and friendly patio space, you can enjoy a cozy meal for a fair price next to some of Stockton’s best shopping. Enjoy classic preparations like Nutella-filled crepes with fruit toppings, or chicken breast and spinach in a chardonnay crème sauce. Bob’s at the Marina is a Delta institution of great breakfast food and burgers you can really sink your teeth into. If you’re hankering for some good ol’ fashion, stick-to-your-ribs home cooking, this is the place to go. Located on a small peninsula jutting out into the Stockton Delta, the large patio and shady trees set the scene for a relaxed late-morning meal. Enjoy breakfast classics like steak and eggs, pancakes and waffles, or dig into something a bit more substantial, like the third-pound burgers, a popular choice—even for breakfast. Tie off your boat at Bob’s guest dock or stroll in through the front door. Either way, Bob’s is a fun, laidback place to shake a hangover or fuel up before a big day out on the Stockton Delta. Located in Stockton’s upscale Lincoln Center, Market Tavern serves up healthy, organic farm-to-table brunch food with local-style flair. Explore unique twists on traditional plates with additions of kale and quinoa in unlikely combinations. The restaurant also includes a bakery with fresh breakfast donuts, muffins, scones and cornbread available for a quick bite on the go. Plus, you’ll find fresh produce, meats and other specialty foods from inside the grab-and-go market. And did we mention the Bloody Marys? Market Tavern has half a dozen blends of this brunch-time classic. Enjoy brunch every Saturday and Sunday from 10 a.m. to 2:30 p.m. This unassuming restaurant inside the Village at Weber Ranch strip mall is the real deal when it comes to brunch. Like the name suggests, America Waffles is a no-gimmick diner serving real food for real people, seven days a week. The plates are large and stacked high with good stuff like thick-cut home fries, fried breakfast sausages and, of course, waffles as big as your head. 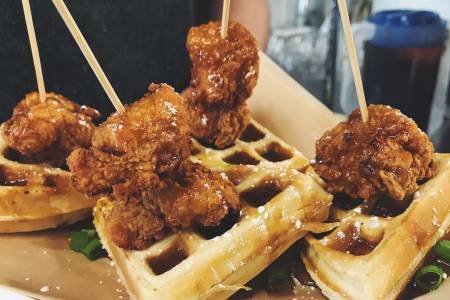 The chicken and waffles here are a house specialty and the best you’ll find in Stockton. Stay a while and enjoy your meal inside this casual restaurant, or take it to go. For one of the earliest morning bites you can get in Stockton, head over to Duck Nook, another unassuming breakfast joint serving up American-style classics. Service begins at 6:30 a.m. sharp and plates at Duck Nook are typically less than $10, so you’ll get a great value for the day’s most important meal. Try the country-fried steak and the house made home fries and gravy. Since opening in 2016, Cast Iron Trading Co. has become a staple in downtown Stockton's brunch scene. Located in the historic Belding Building, neighboring Channel Brewing Company, the cafe offers a unique Sunday brunch flair to patrons — you can’t go past their hearty seasonal breakfast menu. This comfortably hip hot spot offers plates like breakfast burritos, avocado toast, totchos and chicken and waffles, among others. It's usually busy, but the line to order moves quickly, so don't delay in choosing what to eat. If you’re fixin’ for an elegant brunch with a beautiful view, check out the Delta Bistro & Lounge, which serves an amazing spread of brunch favorites every Sunday at the University Plaza Waterfront Hotel. The bistro offers elegant plates in the manicured setting of this world-class hotel, which overlooks the beautiful Stockton Delta. Breakfast is available every day from 6:30 a.m. to 11 a.m. and includes both sweet and savory offerings. Plus, on Sundays you can get great deals on bottomless mimosas to jazz up your brunch with friends or family. Originally from Las Vegas, Mimosas Gourmet opened its second location in 2018 in downtown Stockton. Although crowded on weekends, if you sleep in after a rambunctious night out and wake up for a late brunch, this is your spot. The hot spot offers a.m. favorites like Eggs Benedict, Chicken Fried Steak, and French Toast to name a few. The restaurant name says it all, there is an abundance of flavored mimosas to choose from like guava, peach, prickly pear, and the classic orange served with fresh squeezed orange juice and a healthy dose of champagne. Trust us, there’s no shortage of places to get your brunch on in Stockton. The hard part will be picking just one place to grub. Whether you’re satisfying early-morning cravings, curing late-night symptoms or just looking for a fun place to start the day with friends, the Stockton food scene packs a punch when it comes to brunch. You can message us 7 days a week for assistance on shopping, dining, and things to do in Stockton. Follow us on Facebook, Twitter, and Instagram - and be sure to use #VisitStockton during your visit!